Plastics are everywhere - in our cars, in bottles and under my fingers as I type this post. But, increasingly, there are questions about the synthetic material's impact on the environment and on human health. 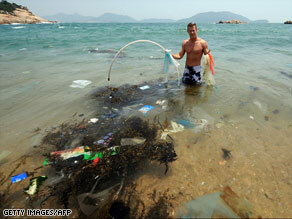 There are some efforts to ban certain types of plastics. Others seek to recycle more. And technology is being developed to make plastics from new materials, like plants, instead of petroleum. BANS: On Tuesday, California's state senate passed a bill that would ban BPA plastics in the state, the LA Times reports. Independent scientists have found that BPA, a chemical found in some baby bottles and food cans, can impair childhood development. On the federal level, the Food and Drug Administration is currently investigating the issue and is expected to release a new opinion in a matter of weeks, the Milwaukee Journal Sentinel reports. The group also discussed hiring a pregnant woman as a spokeswoman for the chemical, referring to such a person as the “holy grail” for the public-relations campaign. That story followed earlier reports in the Journal Sentinel that showed how industry lobbyists wrote large sections of the FDA opinion, released last September. The FDA’s opinion was based on two studies, both paid for by industry. Those studies since have been assailed by an international consortium of scientists as “incomplete and unreliable,” the newspaper reported in April. This June the 151-foot Japanese sailing vessel "Kaisei," operated by a California-based conservation group called the Ocean Voyages Institute, will unfurl its sails in San Francisco and head seaward to assess how to implement the project. The flagship will be joined by a decommissioned fishing trawler with specialized nets. If they are successful, the next step will be to capture and process the waste. Plastics biodegrade very slowly, if ever, and environmental groups worry about their effects on ocean life. Sea turtles, for instance, think plastic grocery bags are jellyfish. They swallow them and then suffocate. If successful with its demonstration facility, Genomatica expects to license its technology to other chemical manufacturers. Schilling said the company has plans for making other chemicals, using a suite of software modeling tools that speed up discovery of ways to manipulate microorganisms to make a desired product. What do you think? Are plastics a valuable technology? Do we need to move on? Send us your comments and questions.